HARLEM — The two City College students who led protests against the school after the closure of a student center last month turned themselves in to police Monday after at least one of them was charged with inciting riot, intent to damage property, governmental obstruction and harassment. 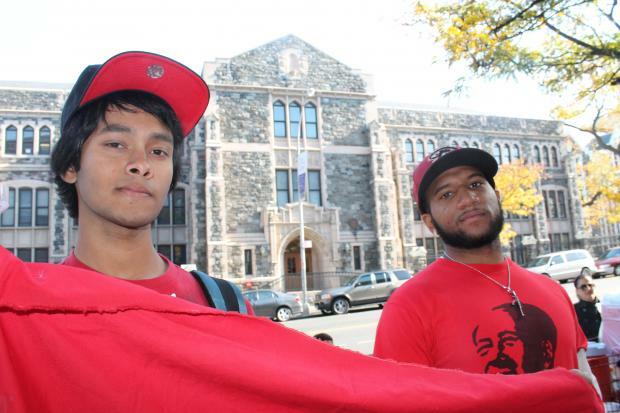 Tafadar Sourov, a 19-year-old sophomore, and Khalil Vasquez, a 22-year-old senior, had already been suspended by the college for their roles in the October protest over the sudden closure of the Guillermo Morales/Assata Shakur Student and Community Center on the third floor of the North Academic Center at 138th Street and Convent Avenue. An Oct. 24 protest over the closure turned rowdy when City College campus police used pepper spray after university officials say the crowd tried to push their way into a building, causing an unsafe situation. An alumnus of the college was arrested and charged with disorderly conduct and endangering the welfare of a minor. "They were operating under their rights of free speech and the right to assemble," said Farhen Hossain, 22, a senior at Queens College and chair of the Revolutionary Student Coordinating Committee, of which Sourov and Vasquez are also members. "This is just an attempt to discourage students from protesting," Hossain said. The pair turned themselves in Monday and will be arraigned Tuesday morning in Manhattan Criminal Court, Hossain said. Records show Vasquez was charged with misdemeanor counts of inciting riot, intent to damage property, governmental obstruction and harassment. Information on the charges against Sourov was not immediately available, but Hossain said both men were being held overnight. A spokeswoman for City College declined to comment on Tuesday. City College officials reclaimed the Morales/Shakur Center early Sunday morning on Oct. 20, just before midterm exams. The space was needed to expand the City College Careers and Professional Development Institute, the school said. The college removed a sign with the name of the center in 2006, following complaints. Both Sourov and Vasquez were intercepted by campus police on Oct. 28 as they attempted to attend class and were banned from the campus. University officials have said they respect students' right to peaceful protests. Disciplinary hearings against the two students were postponed last week, Hossain said. By charging two students who previously had no criminal record, Hossain said the college could be doing irreparable damage to their futures. "If the administration gets their way they could receive a record that they would have to carry with them the rest of their lives," Hossain said.